Perito Moreno Glacier is located in the Los Glaciares National Park near the popular town of El Calafate in Patagonia, Argentina. It is the region’s most famous glacier, standing out as one of the most impressive and easily accessible sights of its kind. 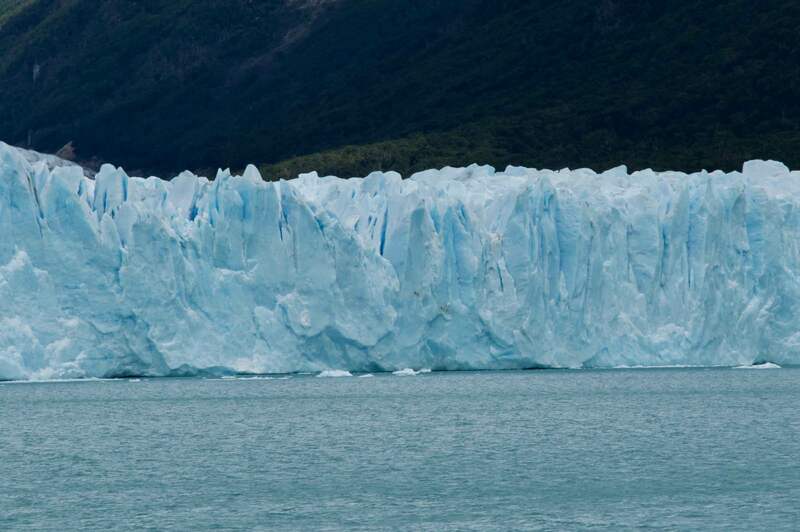 An enormous expanse of jagged, blue-white ice rising 80 metres up from the turquoise waters of Lago Argentino and damming it up with a statement of rock-solid freeze between the mountain rises on either side. Part of the Andean ice fields, which spread throughout areas of Patagonia and create the dozens of glaciers in the region. It’s staggering to see up close and it is easy to get to, plus visitors can choose to take a walking tour themselves or book a spot on a boat cruise, or with an adventure, guide to go ice trekking. In this piece, we’re talking facts, activities, how to get there, and when to go. This one is not to be missed! The expanse of Perito Moreno cannot be seen from one place. It is 30km in length and only about 1km can be seen from the viewpoint. Watching and waiting for the ice to calve. 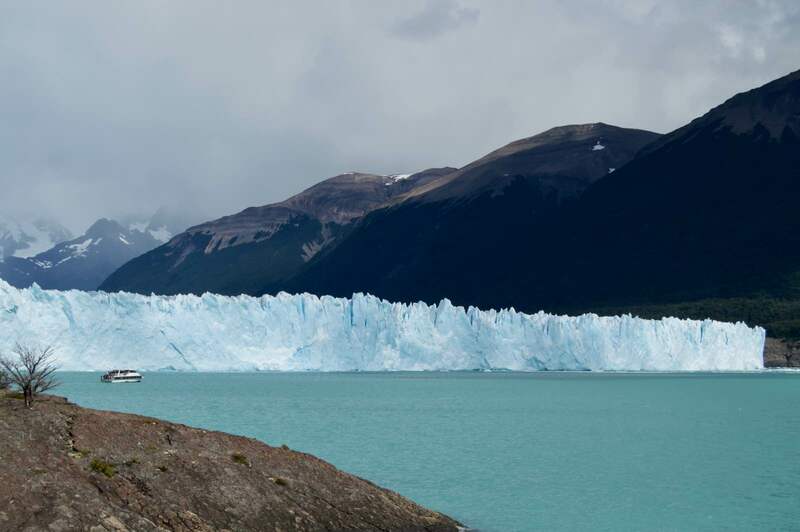 Named after explorer Franciso Moreno, this glacier shares it’s named with the town of Perito Moreno, which is (confusingly) a full day’s drive north of Los Glaciares National Park, in which this world-famous glacier is located. It is part of the world’s third largest reserve of fresh water – the southern ice fields of Patagonia – and it is exceptional in that it is one of the world’s only glaciers that is not retreating, and is in fact, advancing. It is said to have started forming during the last ice age 2.6 million years ago, making it alluringly ancient and full of history. The size of Perito Moreno Glacier is estimated to be about 250 square kilometres in size, 170 metres deep, and 30 kilometres in length. At its terminus, where visitors can view part of the wall of the glacier, the ice rises about 80km above the lake’s surface and is 5km wide. Every couple of years the glacier ruptures and enormous chunks break and fall off into the lake due to the immense pressure, but the calving of the ice on a much smaller scale can be seen often if visitors wait long enough during their visit. Sometimes, pieces of ice break off every 20 minutes. The wall of ice is about 80m above the level of the water. The base of Perito Moreno Glacier with pieces of ice that have cracked and broken off. 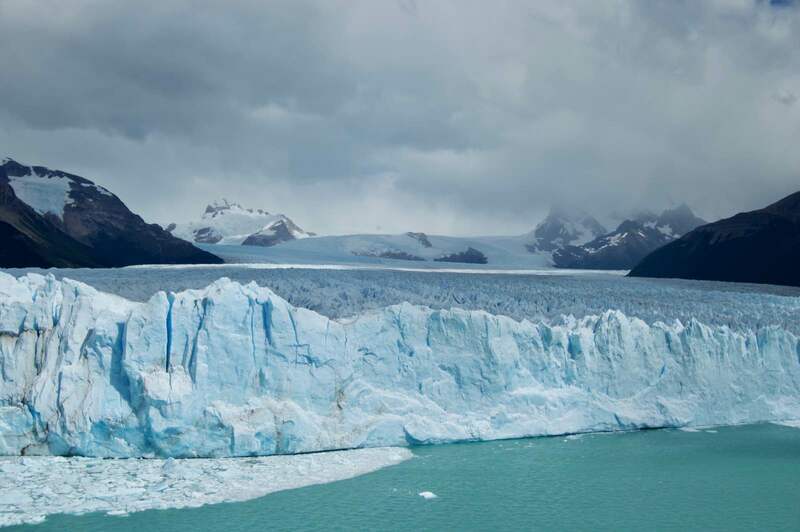 Perito Moreno Glacier is about 250 square kilometres in surface area. 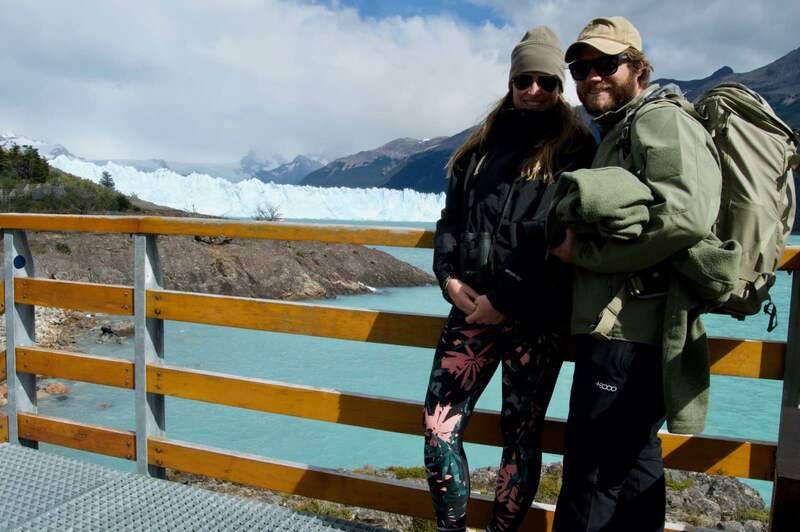 Certainly, the most popular way to get to the glacier is by road from El Calafate, which is a bustling yet quaint and very pleasant town about 80 kilometres away. There are bus rides that depart from El Calafate and take visitors right to the park’s entrance where visitors pay a fee of about US$30. It is not for nothing, but it’s worth it to be able to see this iconic natural feature. Plus, there are a few different view points to stop at, and plenty of birds and beautiful forested slopes to admire along the way. If you’re travelling through Patagonia in a rental car, the short hour-long trip will be smooth, pleasant, and hassle-free whether you follow a road map, the sign posts, or good old Google. Plus, you could give a hitchhiker a ride! 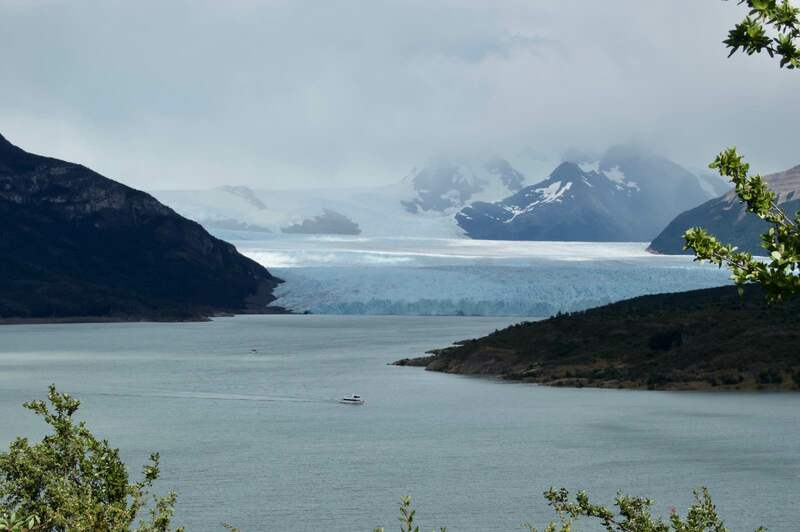 One of the first views of Perito Moreno Glacier en route through Los Glaciares National Park. 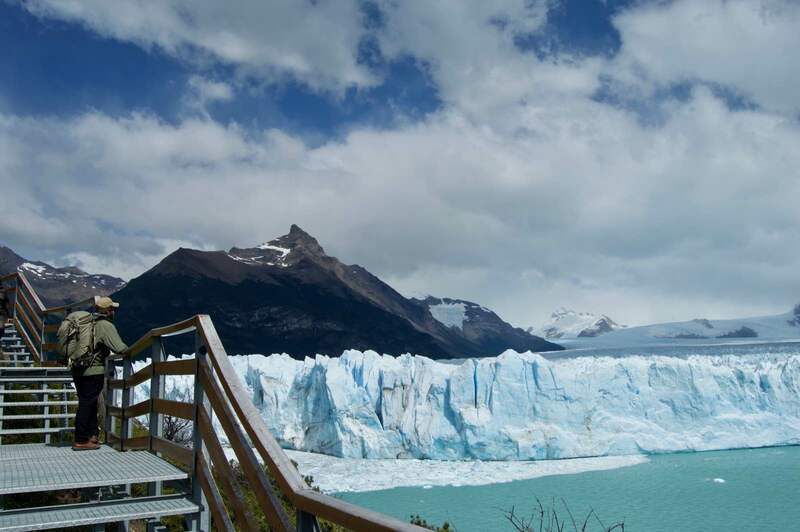 Once at the glacier itself (you will have stopped to admire it from a number of different view points along the way, and each one gets more and more impressive), you can take yourself for a walk along the boardwalk and take your time, stopping for lunch with a glacial view (pun intended) and a bottle of the region’s fine Malbec wine. The walkway is broad and encompasses a full spectrum of views of the glacier, and visitors can go at their own pace, stopping to read informative signboards or take photos of various birds or watch groups of ice trekkers in the distance through your binoculars. This self-guided walk is free of charge, so it is an excellent option for budget-conscious travellers (especially seeing as the bus ride and the park entrance fee already adds up to over US$60). 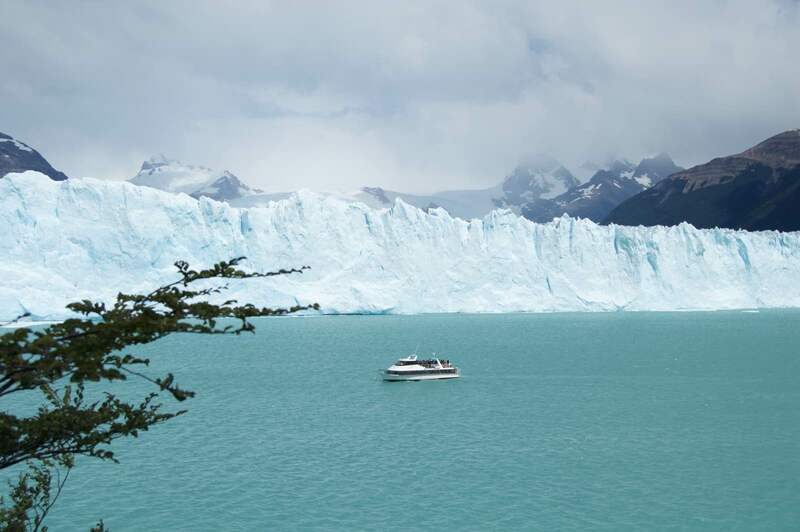 Paid activities at Perito Moreno include the classic boat navigation on Lago Argentina, which is a boat cruise you can book on the day as you arrive in the national park, or the ice trekking tours, which are all about hiking on the glacier itself. 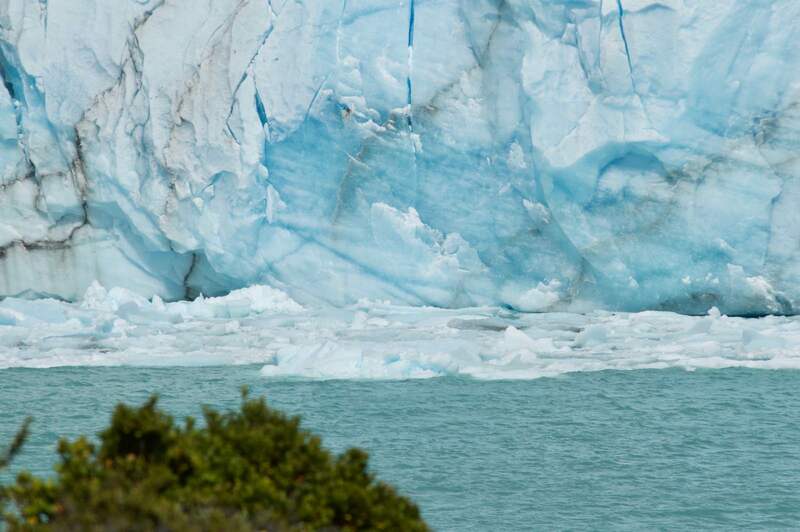 The boat tour takes those on board to about 100 metres from the rising cliff face of the glacier, creating a magical perspective of this great, growing ice berg from the water. Confirm details of the tour upon booking to check what is included in the price and how long the cruise lasts for. Some serve whiskey with glacial ice blocks – a novel added extra! Ice trekking is phenomenal and unforgettable, but it comes at a price of at least US$160, which is the going rate for the “mini trekking” experience. The more extensive trekking excursion lasts for a few hours and includes entertain some ice caves, adding up to about US$275 per person. 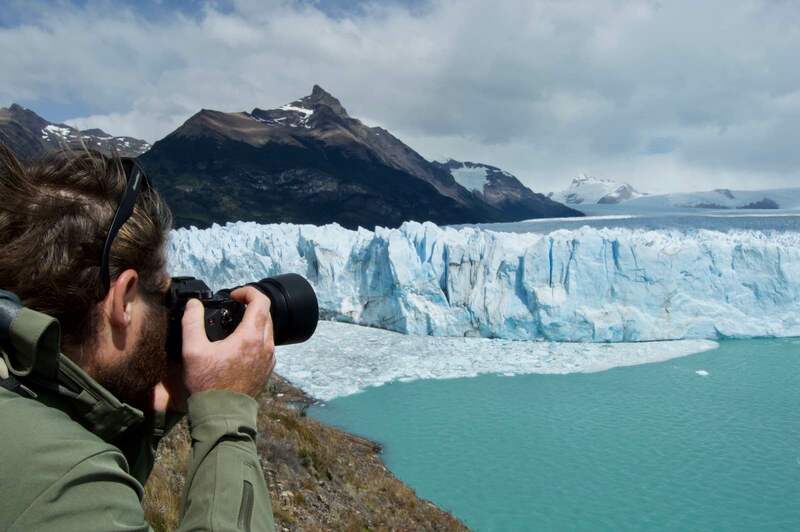 These guided trips are certainly the most iconic experiences at Perito Moreno – donning ice shoes and carrying ice picks and walking on one of the world’s most magnificent bodies of ice is certainly a bucket-list activity, so it is well worth spending the money on if it is the first activity of its kind for you. 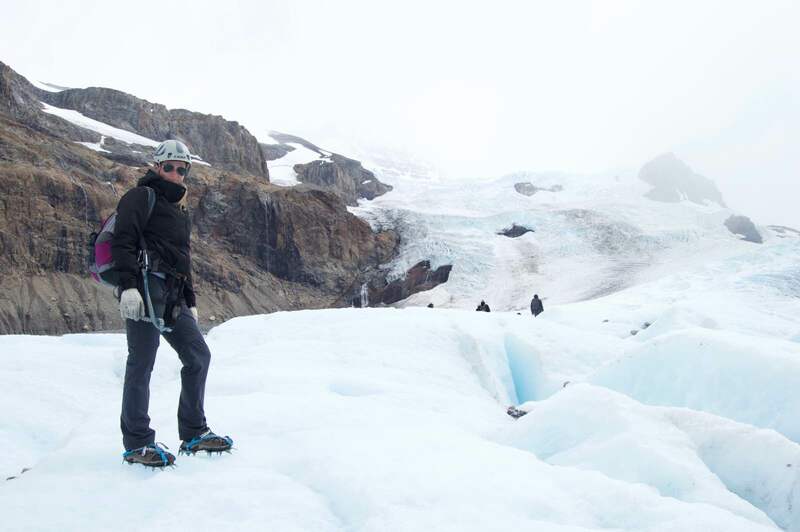 Ice trekking is the most adventurous hiking activity in Patagonia and is a popular activity at Perito Moreno. 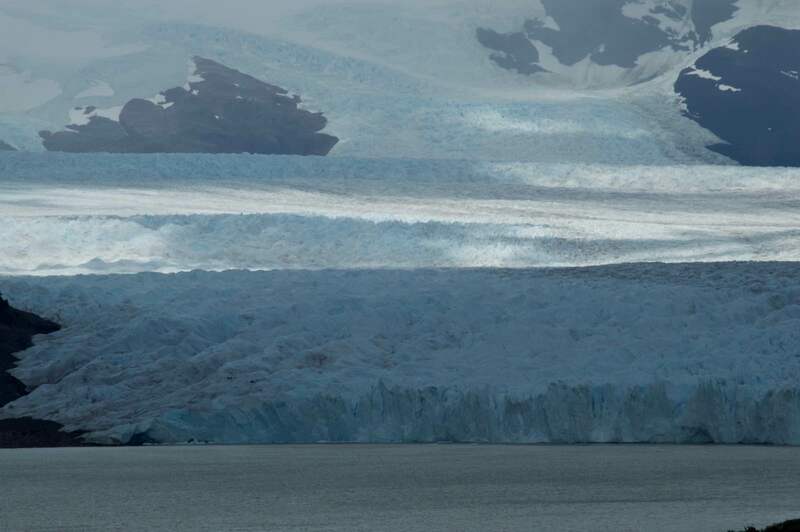 Boat navigations can be booked on the day and take passengers to about 100m from the glacier. 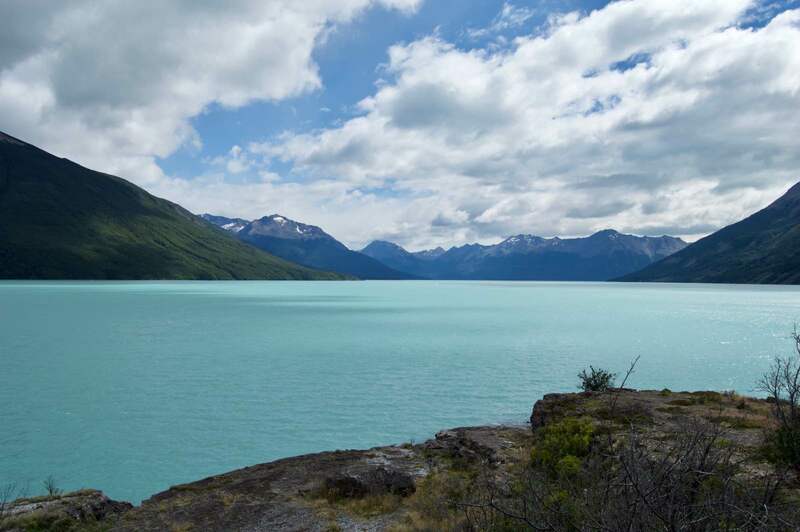 The boat excursions take visitors closer to the glacier than is possible from the boardwalk. Ready to photograph falling ice. The best time to go to Patagonia, in general, is in the summertime between November and March. This is peak travel season, and trust us, this part of South America attracts many adventure-loving tourists, so it’s best to get planning a few months in advance. The weather is often quite hostile with pumping winds, cold air, and rain (even in summer), so good shoes, jackets, scarves, and hats are must-have items for any traveller. In winter the temperatures plummet and it snows and ices over, making it far less popular among tourists who come for the great outdoors! The sunny weather at the glacier is also kind that makes the ice crack and calve, so to stand a better chance of seeing and hearing the thunderous event, visit in the afternoon during the summer when the ice is more ready to crack due to warm weather. Dress warmly, even in summer, because the weather can change and the wind has a chill factor.